Dazzling. 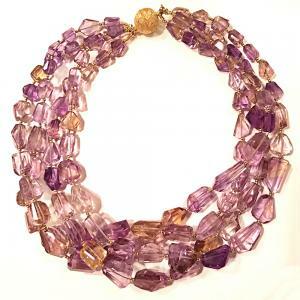 Four strands of faceted, sparkling ametrine nugget-shape gemstones are spaced with tiny 18K Vermeil beads that let each strand move more fluidly and adds an extra pop of gold to this already impressive torsade. This necklace is 18" in length and fastens with a round 18K Vermeil heavy-duty magnetic clasp.